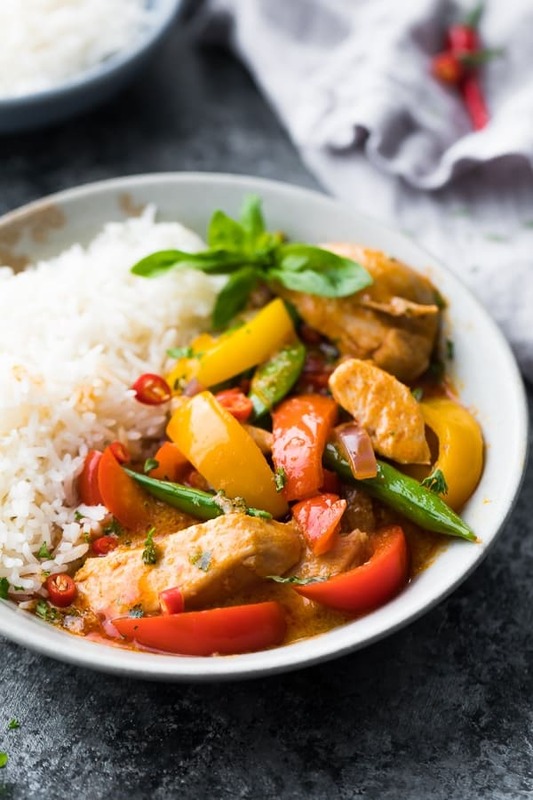 Spicy Instant Pot Thai Chicken Curry is made with creamy coconut milk and Thai red curry paste for a super flavorful (and spicy!) chicken curry. Make it in the Instant Pot and dinner is ready in under 30 minutes! After sharing SEVEN Instant Pot chicken breast recipes on the blog last month, and showing you how you can assemble them ahead and freeze, I’m going through each recipe and photographing the end product. 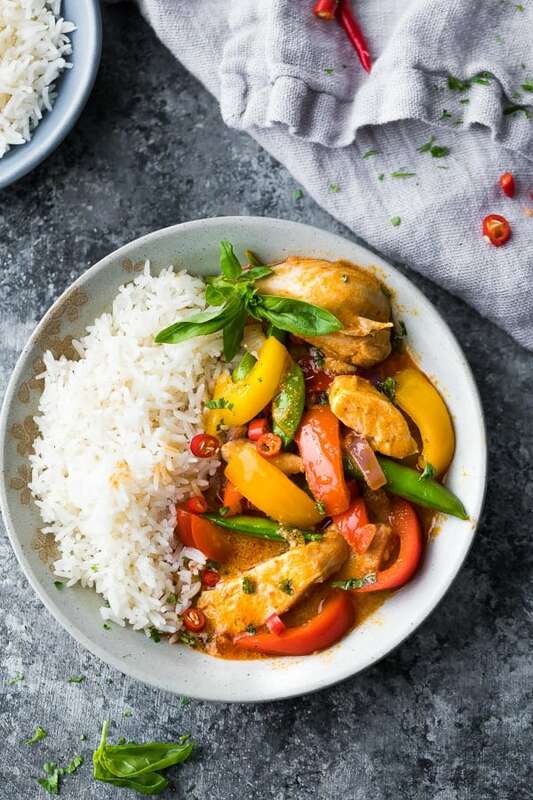 You can check out the Honey Sesame Instant Pot Chicken Breasts and the Instant Pot Creamy Lemon Chicken Breasts, and today I’m sharing this delicious Spicy Instant Pot Thai Chicken Curry! We absolutely love Thai curry in our house, but sometimes all the prep work can take the fun out of it. By prepping the chicken and sauce ahead, you are cutting a significant amount of prep time out. 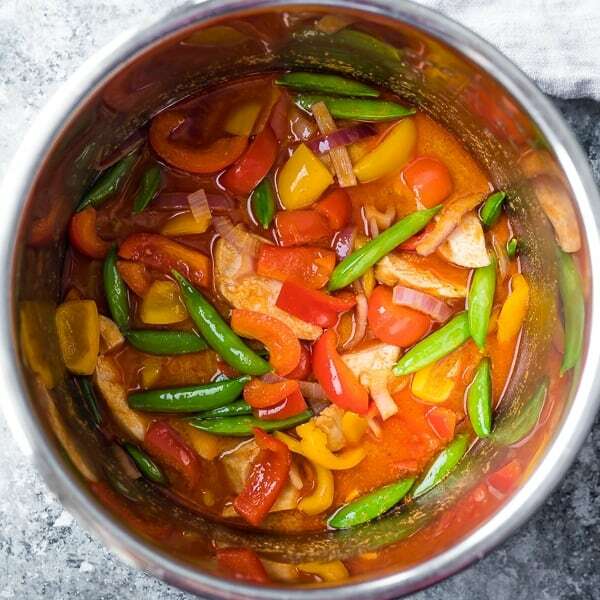 You can chop up the veggies while the chicken & sauce cook, making this one seriously easy Thai chicken curry recipe! 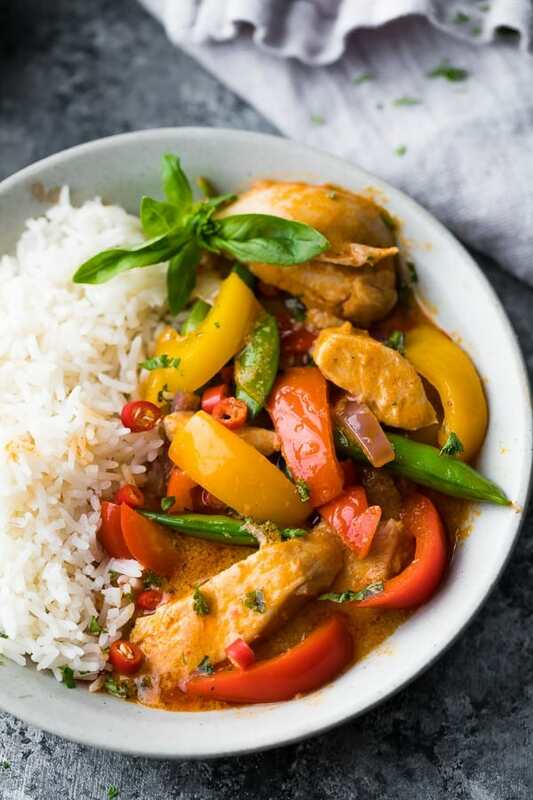 Making this Thai chicken curry recipe in the Instant Pot is slightly different than cooking it on the stove top. First, we cook our chicken in the coconut milk with some red curry paste, fish sauce and brown sugar on high pressure for 8 minutes. Does the coconut milk break in the Instant Pot? I was 99% sure it would, but to my surprise it didn’t! I use a good quality, full fat coconut milk (Thai Kitchen is my fave), and haven’t tried lite coconut milk in the Instant Pot. Want to add extra flavor? Sautee some aromatics in a bit of olive oil before adding the rest of the ingredients. Shallots, garlic and ginger would all be great additions. If you have lemongrass or lime leaves, these would also be a great way to add even more dimension to the Thai red curry sauce! Can I make this recipe in the slow cooker? Sadly, no. 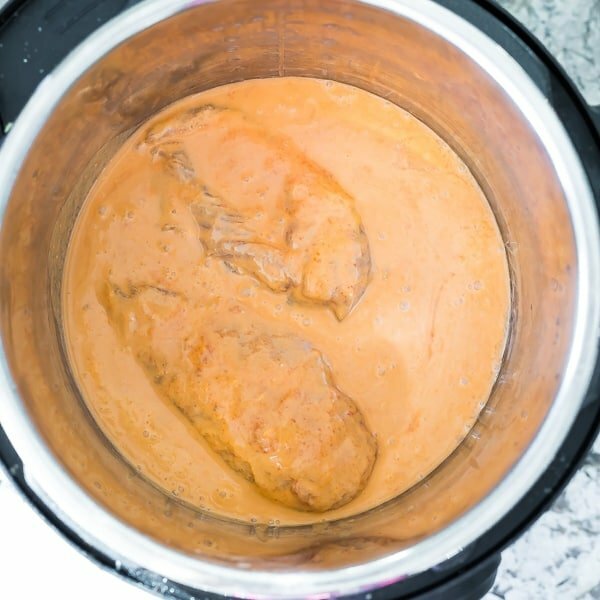 I have tried many times to master this Thai red curry recipe in the slow cooker, but the coconut milk separates, making this not possible. Second, we remove our cooked chicken from the Instant Pot and allow it to rest. Turn the Instant Pot to sautee and we are now going to cook our veggies for 3-5 minutes. I used bell pepper and red onion slices, and snap peas in this recipe, and cooked them until they were slightly softened. What other vegetables can we use in Thai curry? You can go wild here. Bok choy, zucchini, broccoli, cauliflower, carrots, and many more would be great in this recipe. Note you will need to cut hardy veggies like carrots, broccoli and cauliflower quite small to get them to soften. Third, we slice the chicken and add it back to the pot. Squeeze some fresh lime juice and mix it all in. Serve with rice and spoon that delicious Thai coconut curry sauce over everything! You can add some fresh Thai basil or cilantro leaves if you’d like, or just enjoy it as is. Squeeze out as much air as possible. Freeze flat for up to 3 months. So incredibly simple! When you’re ready to cook, you will need to thaw completely before placing everything in the Instant Pot and cooking as directed above. Watch the video below to see exactly how I prepped my Spicy Instant Pot Thai Chicken Curry. It’s so easy! You can find more of my recipe videos on my YouTube channel, or on Facebook. Combine all ingredients not listed 'after cooking' in a 6 quart Instant Pot. Cook on high pressure for 8 minutes. Do a quick pressure release (release the pressure immediately after the Instant Pot beeps). Remove the chicken from the IP and set aside to rest. Select 'sautee' and add in the lime juice and vegetables. Cook, stirring frequently, for 3-5 minutes. Slice the chicken and add back to the Instant Pot. Combine all ingredients not listed 'after cooking' in a gallon size freezer bag. Squeeze out as much air as possible. Thaw completely before cooking as directed above. Amazing dish! One of the first I made in my InstaPot but it has won me over. I’m a crossfitter and track my macros, I love how well balanced, simple, and cheap this meal is! It’s in my regular rotation for meal prep meals 🙂 I typically add extra vegetables such as zucchini, cauliflower, snap peas, shredded carrots, and serrano peppers to kick it up a bit. I recommend this to everyone! I’m so happy to hear you like it! Thanks so much for taking time out of your day to leave a review, Sara! Just as good as take out! This will be in our regular recipe rotation from now on! This was amazing! Restaurant quality, and I would know…it’s my favorite dish at Thai restaurants! I used less vegetables: 1 can of Baby corn cut in half & a red pepper. The easiest, quickest, tastiest Thai curry recipe. I used Arroy-D curry paste and it came out perfect. I can’t believe how quickly this is made. I purchased a pressure cooker months ago and never used it. Now I’ll have to go through all the pressure cooker recipes you have. Love this so much, thank you. YAY! Thank you so much for your review, Mel! I hope you enjoy some of the other pressure cooker recipes on my site, too! Yes, I bet that would be great! YUM! Could I use frozen veggies for this next time? Made this recipe the other night, and loved it! Made one small mistake in that I cut the chicken breasts before cooking. OOOPS. Never mind, the result was still awesome. The chicken was cooked to perfection, and the veggies were as promised. I did thicken the sauce with a tablespoon of potato starch dissolved in a bit of water. Definitely a keeper! Hi Henk! SO happy you enjoyed and that the chicken was cooked perfectly even after cutting! Thanks so much for leaving a review! Do you think this recipe would work well made in advance and the popped in the freezer? I am looking to make some meals in advance to take to work for lunches. Hi Jacky! Yes, you can cook and portion out with rice and freeze, works great! Made this for supper tonight and it is absolutely delicious!! It is simple to pull together, and I like that I can use many different types of vegetables. 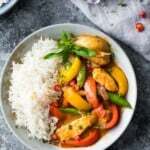 I served it over basmati rice, and it was a hit with both hubby and I.. I didn’t include any of the sugar, the only thing I don’t like about Thai food is the sweetness, so I was happy to be able to avoid that. I also didn’t use the quick release. I did a natural pressure release of 15 minutes instead, since I believe this makes the meat more tender and juicy, which it certainly was. Perhaps next time I have to be brave and try the QR. I will be trying more of your recipes, and thank you so much for this one! I made this recipe to freeze and make later… Upon defrosting, the coconut milk has separated and I’m at a loss what to do? Hi Kimberlee! I’m surprised to hear this, but I would just cook as indicated. Were you using full fat or light coconut milk? I’ve had issues with light separating in the slow cooker but haven’t had issues with it separating after freezing. The coconut milk didn’t say, so I assumed it was full fat. Could have been our issue, certainly. I have 3 more prepped curry in the freezer, won’t hesitate to make them again. I made a bit if cornstarch and cream to disguise the grainy look of the curry. Thank you for replying and I enjoyed this recipe very much! One of the best meals I’ve made in a while! I doubled the recipe and used the same cooking time, perfect! Thank you for this great recipe!! Can i double this recipe with the same cooking time? Hi Morgan! That should work, but if for some reason the chicken is under, you can put the lid back on and cook for a bit longer (the pot will come back to pressure really quickly). Hope you enjoy, and if you try it with double the ingredients, I’d love to hear how it worked for you! Made this for the first time this evening and loved it! I look a few short cuts and added a few things….sauteed some ginger and garlic in sesame oil before adding the red curry paste….added some sort of a chili oil paste from Thailand, used Kirkland brand frozen chicken tenders and a freezer mix of veg since that’s what we had in the house….and cooked it in a regular pot on the stovetop! Turned out totally delicious – super easy – will definitely make it again! Just made this and the family loved it. Super easy and Minimal ingredients. i have made this dish several times and it is my husband favorite. I can’t think why your coconut milk separates in your slow cooker. I use it often in my Crockpot with no problems. Also, showmetheyummy.com has the same recipe on the internet for a Crockpot. Perhaps that could give you some ideas on what to do. Hi Surya, I can tell you I’m definitely not the only one to have issues with coconut milk breaking in the slow cooker, as I have heard this from readers as well. It could be differences between slow cooker models (mine cooks quite hot, even on low). I found it to be a bigger issue with lite coconut milk than with full fat. 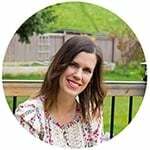 I always thought it was strange to see so many slow cooker coconut milk recipes on the web since I’ve had such problems with it.